Tournament Director for; Saccomaniacs Ag4Autism Charity Golf Tournament, Aplin Martin Golf Tournament, B and B Contracting Charity Golf Tournament, BCFPA/WDC Golf Tournament, Wolseley BC Charity Golf Tournament, Women’s Media Golf Classic, Coast Capital Savings Charity Golf Tournament, BC Sports Hall of Fame, BC Hospitality Foundation, Ovarian Cancer Canada, The Shriners of British Columbia, The BC Restaurant and Foodservices Association, The Zlotnik Foundation, The Leaders Invitational, The Zajac Women’s Tournament, The One and Only Golf Tournament, Logotex Charity Classic and the Wood Gundy at Park Place Charity Invitational. Donahue awarded Certification by Golf Tournament Association of America. She has accepted an invitation to sit on the Board of Advisors for the GTAA. The GTAA is the Association for all Golf Tournaments and Events – Fundraisers, Corporate Outings, Networking, and Amateur Competitive Events. 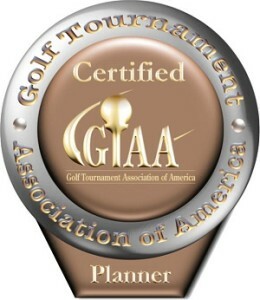 GTAA serves everyone in the golf tournament industry: tournament coordinators, golf courses, suppliers, charities, associations, meeting planners, civic groups, schools, churches, and all groups or individuals involved in a golf outing. It is here to serve and assist organizations in taking their events and business to the next level through education, information, and marketing. The GTAA offers seminars, newsletters, teleconference calls, trade shows, and educational materials. 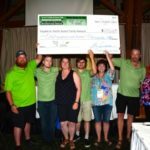 2018 Thank you BCFPA – WDC (and Dawn): you run an amazing tournament. Congratulations on making it even better than last year, which I thought would be impossible. Thanks again, it was a fantastic day! I would just like to tell you that we had an absolutely wonderful time at the Saccomaniacs golf tournament. We are looking forward to next years tournament already I must say this was one of the best tournaments Rebecca and myself have been in and thoroughly enjoyed ourselves. The BC Dairy Council and the BC Food Processors Association cordially invite you to their 44th Annual Golf Tournament and Dinner. 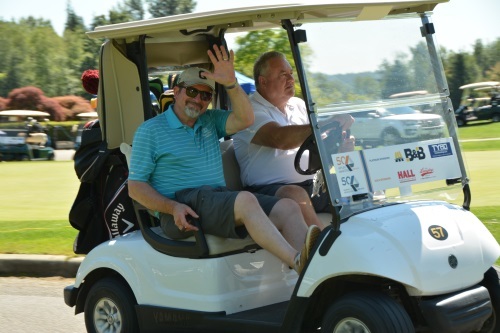 Our annual golf tournament, with two golf courses, and food and beverages galore is the business development and networking sports event of the year. Thank you everyone for joining us for Golf and dinner! 100% first class…from initial communication and registration, follow up, to arrival and breakfast, golf (good pace of play), on course exhibitors, to speeches (nice and short), prizes (not too many…excellent), and dinner (1st class). I wouldn’t change a thing. No need to. The best organized and executed golf event I have played this past year! In its 10th year, Founder Steve Saccomano and family raised over $103,000 for Pacific Autism Family Network. A great day, a wonderful fundraiser. Agriculture for autism included our local suppliers, farmers, associations, and culinary destinations for a day that was more about the charity and the camaraderie, although the golf was fun and the venue was important. 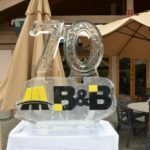 Celebrating its 70th year in business, The B&B Contracting Group has established itself as a mainstay within the civil construction industry across the Lower Mainland. B&B prides itself on its history of quality workmanship, community involvement, and exceptional customer service. B&B specializes in site preparation, excavation, utilities, road work, highways, infrastructure, and railway work. Our solid reputation in the industry and our ability to offer competitive pricing allows us to maintain a steady workflow all throughout the year for our private, municipal, commercial, and federal clients. We invite you to join us in participating in and sponsoring our Annual Charity Golf Tournament which takes place on – July 19, 2018 at the Hazelmere Golf & Tennis Club. This year, Aplin Martin and Murray & Associates celebrate 50 years of success in making sustainable communities a reality across Canada. Over these five decades, we have grown into a multi-disciplinary firm of civil engineers, urban planners, architects and land surveyors. In celebration of this milestone anniversary we are inviting you to attend Aplin Martin / Murray & Associates 50th Anniversary Golf Tournament to be held at the spectacular Lee Trevino designed Swaneset Bay Resort & Country Club on Thursday, July 5th, 2018. The day is sure to be a memorable one with plenty of good fun, good food & drinks, good golf, and great opportunities to meet incredible people like you that are an integral part of our success and longevity. Once again, thank you for helping us make the first 50 years so extraordinary! We look forward to greeting you at Swaneset Bay Resort & Country Club as our special guest. In its 9th year, Founder Steve Saccomano and family raised over $65,000 for Pacific Autism Family Network. 32 teams took to the Plateau golf course – a perfect field to enjoy a tournament in under 5 hours! A great day, a wonderful fundraiser. 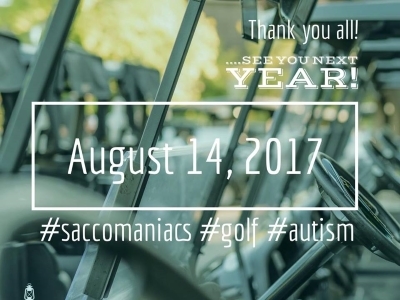 The 8th ANNUAL – Saccomaniacs Charity Golf Tournament was held on AUGUST 15, 2016, at Westwood Plateau Golf & Country Club – Click to watch Video Summary. We have Pictures!! Have a look at our photo gallery for pictures of this event. 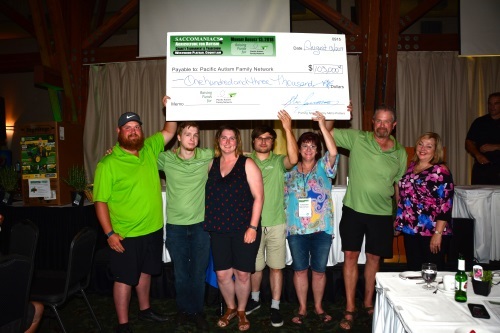 The 7th annual, in 2015, RAISED OVER $40,000 for Pacific Autism Family Centre! 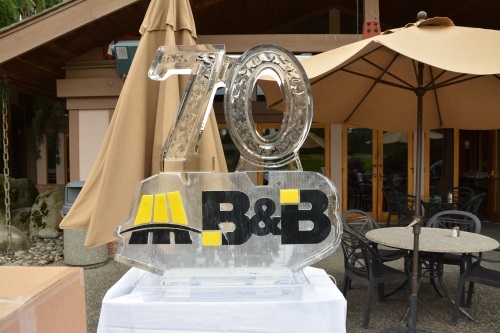 The day included two golf courses, 180+ golfers, 230+ attendees for dinner, with breakfast, lunch, and food and beverage samples for all 36 holes. 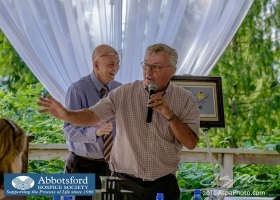 Over 40 volunteers supported the golf tournament and fundraiser, with a lively auction and wine cellar draw. Agriculture for autism included our local suppliers, farmers, associations, and culinary destinations for a day that was more about the charity and the camaraderie, although the golf was fun and the venue was important. Coast Capital Savings Charity Golf Tournament 2013, 2014, 2015, 2016 Proceeds from this year’s event will once again benefit the VGH & UBC Hospital Foundation in support of depression research. Since 2002, we’ve raised over $1.8 million in funding for depression research. 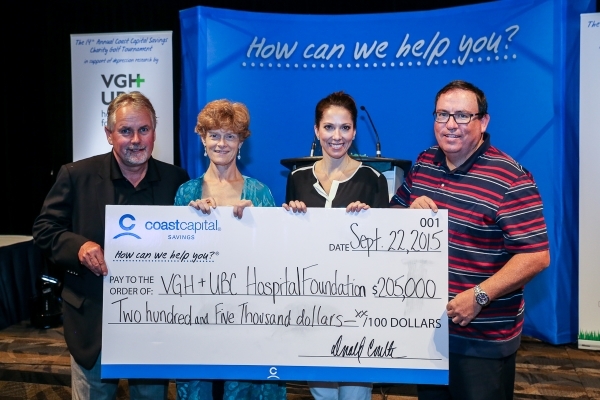 Our goal this year is to raise over $2 million dollars towards this important cause. The Leader’s Invitational, founded in 2002, is a golf tournament and tradeshow fundraiser. Guests travel from across North America to attend, requiring various accommodations in local properties. 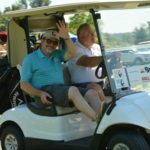 Using two golf courses, the event requires over 100 volunteers to produce this one day event, which raises over $500,000 annually. Attended by 300 golfers, 150 tradeshow hosts, and special guests, this event requires an annual infrastructure to be built each year. 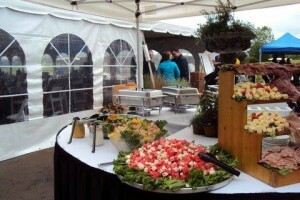 The infrastructure includes 225 golf carts, 50 tents plus a 6000 square foot marquis, seating for 500 for dinner, trailers for office, storage, and washrooms, a 58 foot refrigerated trailer for food and beverage storage, 12 large bins for recycling and garbage, 12 portable toilets, and 500 plants for décor. Guest chefs host food stations for breakfast, lunch and dinner. On course tradeshow booths showcase the finest of local products and beverages, with pairings such as Northern Divine Caviar and Sumac Ridge Stellar Jay sparkling, a 12 hour roasted pig, served with a citrus ale, fresh farm eggs and local pork sausages all wrapped in a house made sun dried tomato tortilla, local food trucks, local beer, wine, and distilled products. The tournament is a networking and business development event, where the score isn’t as important as the comradeship and the cause. Go Golf Events Management (GGEM) is the founding producer, and continues each year to increase support, and host a new and exciting event, continuing to keep interest high. Attendees comment every year: “they can’t wait to see what will be added in the next year”. This event sells out annually, with a wait list.